A hornet is a wasp, but not all wasps are hornets. Always read and follow label directions. Spray in early morning or late evening when insect activity is low. Direct the spray towards the opening of the nest and thoroughly soak the opening, but do not destroy the papery envelope of the nest when treating. Do not stand directly beneath the nest during treatment. Avoid any hornets that fall from the nest after treatment. Never attempt to spray individual hornets, especially when in flight. It is very difficult to prevent hornets from building nests around your home. 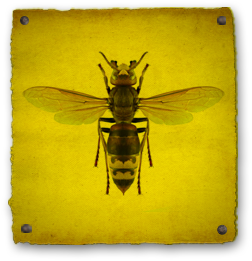 Inspect large shrubs and trees for hornet's nests. At the first signs of activity, spray small nests. Check the nest after 24 to 48 hours and if no activity is observed, then the nest can be safely removed. Large hornet nests found in secluded areas can contain thousands of hornets and can be very aggressive if disturbed. Hornets can sting. Be very careful when using traps and other insect control products. If the nest is located in an area too difficult for you to treat, call a professional pest control company or the municipal public health department for assistance.